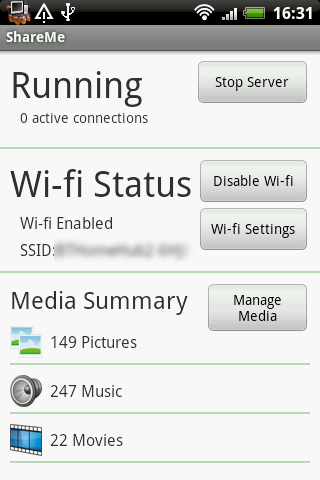 Welcome to ShareMe, our UPnP/DLNA media server for Android. ShareMe supports DLNA 1.0 and 1.5 (configurable from the settings menu). From here, you can also change the share name of your device. Our implementation of some of the DLNA features is not yet complete, but it should be enough to get your media on whatever device you use. We will be improving this over time. 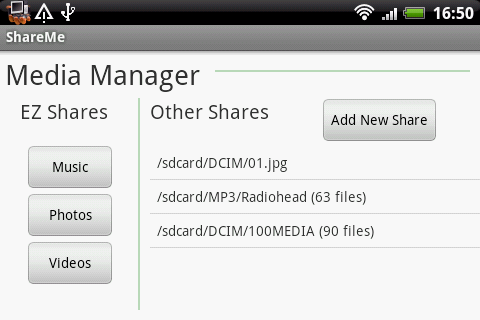 Using our EZ Share feature, you can easily share all media from your Android device. But if you want more control, you can add shares as either a single file or a directory. Single file shares can also view (or listen) to the media from within ShareMe. ShareMe runs as an Android service, and permanently displays a notification so you know if it is running. No need to worry if the application is closed. Services are managed by Android, and will restart automatically if killed by a task manager.